Freshly baked biscuits get me every time. 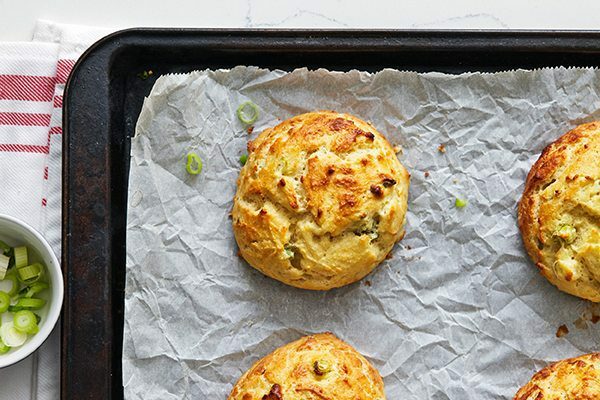 Nothing beats the smell of buttery, golden brown biscuits or drop biscuits – especially when they’re still warm from the oven. 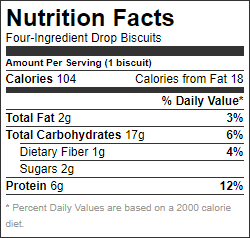 Unfortunately–to nobody’s surprise–most biscuits are loaded with fat. Not only will you find butter mixed into every nook-and-cranny of dough (that’s what makes them flaky), but many biscuits are then slathered with extra butter before serving. It seems a bit excessive, doesn’t it? This super simple, four-ingredient recipe is a great way to indulge in a lighter version of traditional biscuits. 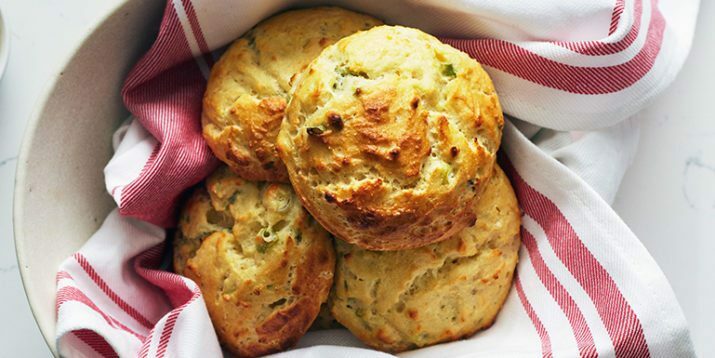 Rather than relying on heaps of butter, Greek yogurt keeps these drop biscuits light in both calories and texture. Yogurt is a genius substitute that not only cuts down on the fat; but it also helps replicate the familiar tang of buttermilk biscuits. Make sure to use whole milk Greek yogurt for the best results, as a little bit of fat is needed for flaky biscuits. 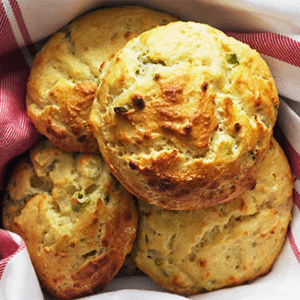 To take your drop biscuits completely over the top, you can fold in fresh herbs or cheese for a bit of extra flavor. Green onion and cheddar cheese a personal favorite of mine, but I encourage you to get creative! Line large sheet pan with parchment paper. Set aside. Combine flour, baking powder, and salt in a large bowl; mix well. Add yogurt; mix well. Dough will be moist. Drop dough onto prepared pan using a ¼ cup measure. Place dough at least 1½-inches apart. Bake for 15 to 20 minutes, or until golden brown. Add ¼ cup of your favorite chopped fresh herbs (like basil, parsley, cilantro, or oregano) when adding the yogurt. Add ¼ cup chopped green onions when adding the yogurt. Add 2 Tbsp. chopped fresh rosemary or thyme when adding the yogurt. Add ½ cup shredded cheese when adding the yogurt. Make sure you add 1 tsp. when calculating your container equivalents. Add ½ cup crumbled feta, blue or goat cheese when adding yogurt. Make sure you add ½ tsp. when calculating your container equivalents.